Non dairy whipped cream FrostyWhip is prepared by mixing our blend with water, it can be mixed from a one to one ratio with water up to one to four ratio. FrostyWhip is widely used to prepare the most exquisite whipped cream dairy free recipes like mousse, terrines, frozen parfaits and more. Frosty Whip products have excellent serving durability; they can be put on display without refrigeration for up to 8 hours and will still hold their shape. Simply mix with water (~17ºC) and whip. This product can be mixed from one part of water up to four parts of water. Once prepared, Frosty Whip cam be frozen and defrosted without cracking or loss of aeration. Can be stored at room temperature for long periods of time without collapsing or melting. 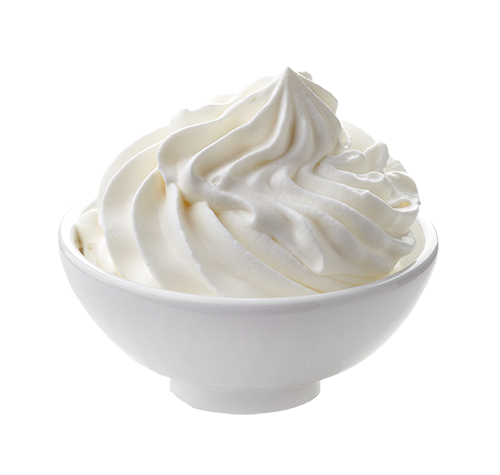 Lower in fat; Frosty Whip has only 7.% to 18% fat, depending on the water ratio used compared with 25% of regular dairy cream.